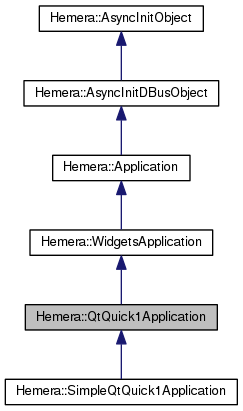 The base class for Hemera Qt Quick 1 applications. QtQuick1Application holds all the needed logic for applications based upon Qt Quick 1. Compared to WidgetsApplication, it does not manage QWidget directly, but only takes a QUrl of a Qml file instead. Such a URL can be also the URL of a resource or qrc resource. QtQuick1Application should be used when you need to mix Qml and C++ logic. If you don't need C++ logic in your application, you can simply use Hemera::SimpleQtQuick1Application in your ha file, which does not require you to write any C++ code. During the initialization phase, it is possible to interact with the declarative engine before any component is loaded. This allows to interact, for example, with the context before it starts taking effect. QtQuick1Application uses a software rasterizer to paint on the screen. In case your device is GL capable, you might be better off using Hemera::QmlGuiApplication. Enquire with your representative to find out if that is the case. On the other hand, running a WidgetsApplication is supported on every Hemera device, even if it does not guarantee the best performance. Please note that running Widgets-based applications on EGLFS, although possibly working, it is not supported, and you are voiding your warranty when doing so. The advised choice is either LinuxFB or X11. Please enquire with your Hemera representative to learn more. mainQmlFile The main Qml file to be loaded on startup. Usually a resource or qrc path. This function returns a meaningful value only when the initialization procedure is started. It can be called in initImpl, but MUST NOT be called in the constructor.